Quinnipac’s Allison Kuhn scored the game-winning goal just over three minutes into overtime as the Bobcats edged Stetson, 14-13, in the season-opener for both team Sunday at the Athletic Training Center. In a back-and-forth affair in which the largest lead was two goals, Stetson (0-1) forced overtime when Taylor Zuberer scored with 5:03 to play in the second half. The Hatters had three chances to take the lead in the final minutes of regulation but couldn’t find the net. Stetson and Quinnipiac (1-0) spent the entire afternoon exchanging goals. Shelby Lehmann scored five goals in the first half for the Hatters but Stetson trailed, 7-6, when the game reached halftime. Sandra Stephan scored a pair for the Hatters to start the second half as Stetson squeaked ahead, 8-7. Hannah Mill and Karli Maguire each scored to make it 10-9, and Maguire added a second goal for an 11-10 advantage with 16:56 to go. Quinnipiac responded with three straight goals over the next seven minutes – the first time all game either team scored consecutive goals – taking a 13-11 advantage with 9:40 to play. 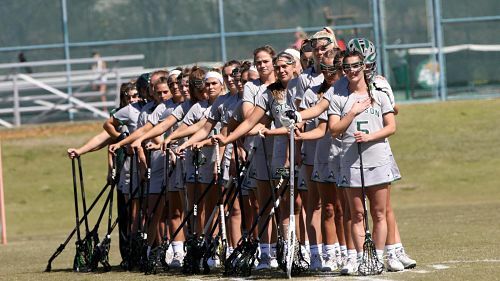 Marina Rotella pulled the Hatters within 13-12 before Zuberer knotted the game and helped Stetson force overtime. The game was a statistical dead heat as shots (30-31), ground balls (25-24) and draw controls (16-14) were virtually tied. Lehmann led the Hatters with five goals as Maguire, Stephan and Rotella each scored twice. Riley Reagan had four assists. Sarah Flatt won five draws while Kiera McCarthy had six ground balls and 10 saves in her first collegiate start. Kuhn led Quinnipiac with five goals. The Hatters next host Monmouth, Noon, Saturday at the ATC.